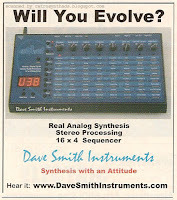 Dave Smith Instruments Evolver "Are You Evolving?/Now shipping!" 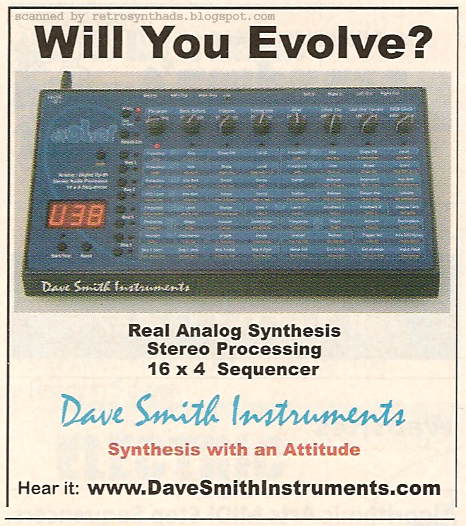 colour advertisement from page 129 in the classifieds section of the December 2002 issue of Keyboard magazine. I don't remember the exact date I ordered mine, but my invoice - yup, still got it! - says it was shipped on December 9, 2002. The same month this "Now Shipping" ad came out. Boom! Similar to the previous "Will you Evolve?" ad (right) that ran from September to November, this ad replaced it in the classified section of Keyboard magazine. DSI still wasn't ready to spend the cash for an half or full page ad yet. But, this advertisement had evolved - pun intended! Specifically, Dave shelled out for another half inch of ad height to make it an even three inches. "From the man who invented the first programmable polyphonic synths, MIDI, the first software synths, Prophet 5/T8/VS, Pro-One, Wavestation, etc." As mentioned in the previous blog post, I suggested that DSI may have decided to spend less on advertising in these early days, relying instead on earned media garnered through the use of Dave's name and credentials. And quite a list of creds they are. It was a smart move and a smart way to save some money early on. Its fun for me to see a new branch split off from the synthesizer tree of life and witness it's evolution over time (again - pun intended - it never gets old!!!). But, if you want to get technical, these early advertisements weren't the first time that regular readers of Keyboard Magazine would have heard of this new beast. That happened... can you guess? You bet! Exactly 15 years ago in Keyboard's April 2002 feature article on Winter NAMM 2002. 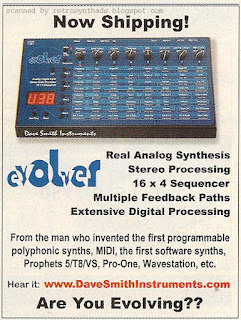 Sure, technically, that meant the Evolver announcement actually came during Winter NAMM in January, but let's keep this exciting, shall we? Mr. Sequential Circuits is back with a new hybrid analog/digital monophonic synth module. 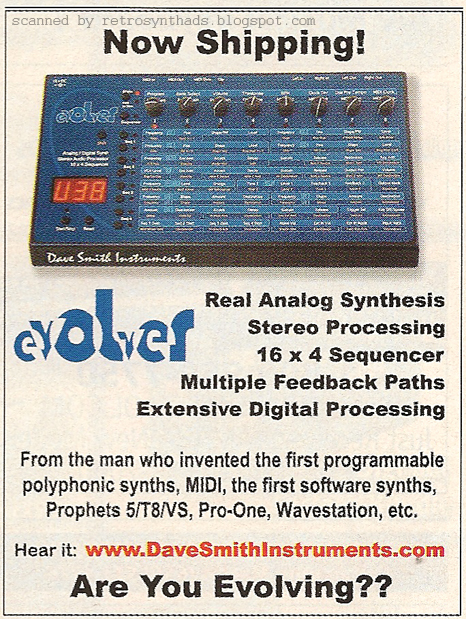 The Evolver features two analog and two digital oscillators, with separate glide per oscillator, oscillator sync, and pulse width modulation, four delayed ADSR envelopes, four syncable LFOs, and dual tunable feedback loops. Delay, chorus and flange effects are also syncable to MIDI, as is the 16-step by 4-track analog-style sequencer. It's great to see Dave making hardware synths again." Historically, I really dig this little ditty for two main reasons - the first is pricing info. Or in this case, the range in estimated pricing. At NAMM in January, there was obviously still some question as to what the final price would be. And the other thing I really dig historically about this ad? The intimacy between Keyboard Magazine and Dave Smith. That's some big time respect right there. And deservedly so. It all goes back to show how DSI made the right decision to name the company after himself, and to make Dave the face of the organization. Smart moves righ there.